Optimizing a Legal Department begins with having visibility and control over your individual and collective workloads. How do you collect and centralize your Legal Department information? 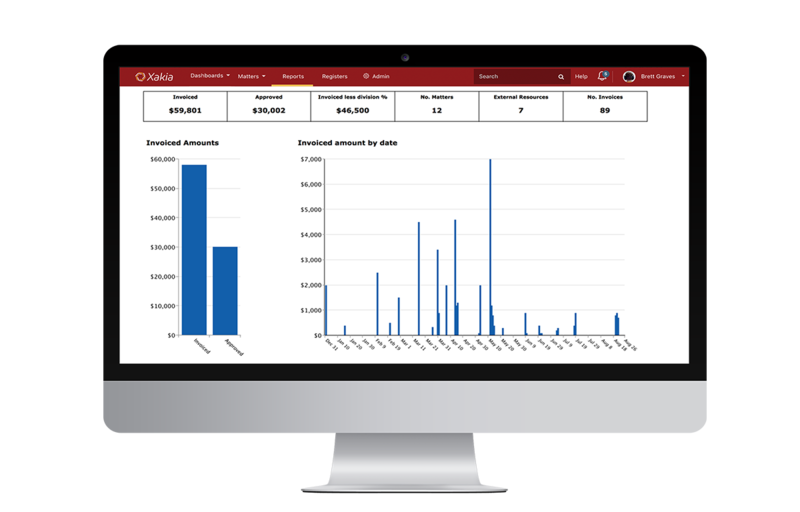 Xakia is an easy-to-use, affordable software for in-house Legal Departments of 2 to 2,000. 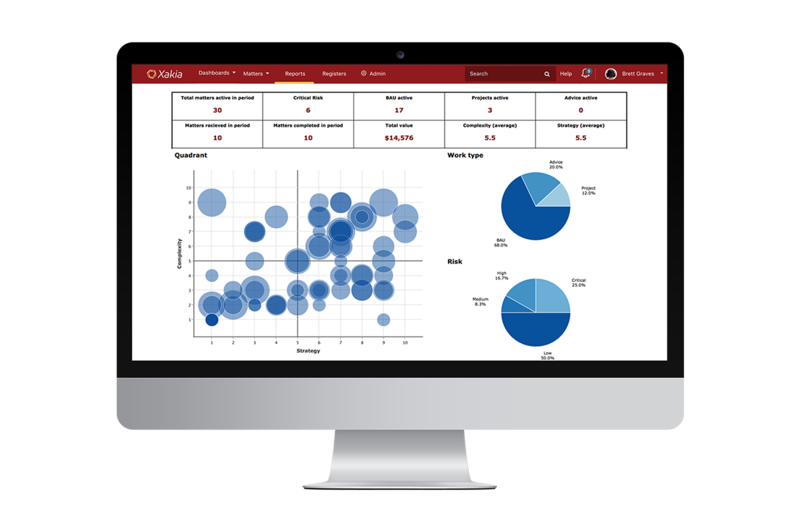 Using a simple, clean interface, Xakia provides effortless clarity on your team’s workload and powerful insights using beautiful, automated dashboards and reports. Users across the globe are thriving with Legal Department Intelligence. Xakia developed a software that will deliver quality metrics and information without adding new time burdens for BlueScope. Xakia’s straightforward interface takes 30 seconds or less. Start benefiting from real-time intelligence. Xakia will help you control your budget, match the right resources to the right work and build a more productive team. 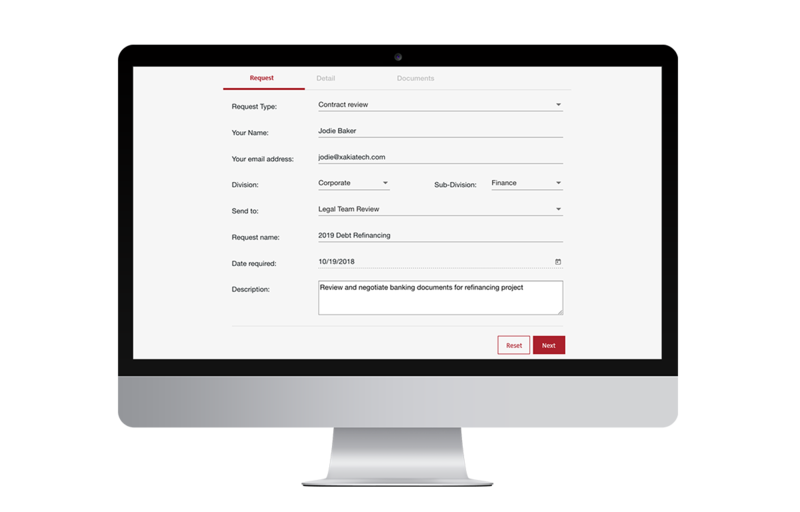 Automated reports save you considerable time – and demonstrate your value to the C-suite. LegalTech should be easy. We’ve made it easier. 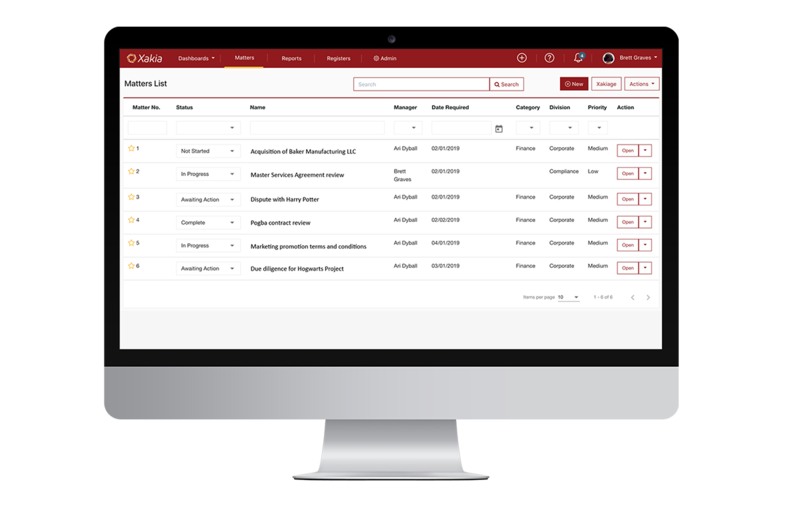 Xakia provides a single, matter-centric platform from which you can access all of your legal technology tools. With Xakia, you can bring together all of your enterprise and legal-specific solutions into a simple interface, making it easier for your team to find the tools they need and keep all their information accessible from one platform. 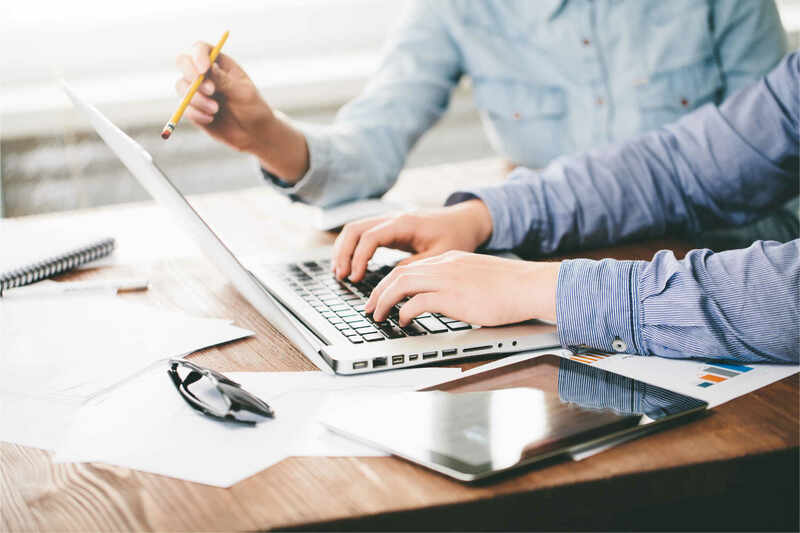 Along the way, we promise to keep your information safe; to provide help whenever you need it; and to give you straightforward and predictable pricing. Humans are available to help you get started and to answer any questions you may have. We publish our pricing to make your selection and budget process as easy as possible. If you would like a demonstration of Xakia, please contact us here. For Legal Teams of more than 50 users, please contact us for a quote. Matter tracking and organization is particularly beneficial to small law departments, because of its added functionality over the old-school method of using spreadsheets … We can also save time by loading the invoices into our matter-tracking system as opposed to individually tracking legal service invoices. Even as a new Xakia subscriber, we are already collating data which will help us manage and resource the company’s legal requirements better, as well as identifying opportunities for professional development. Our in-house legal team are excited for the implementation of Xakia Matters. Xakia Matters is very easy to use, the reporting functionality is more sophisticated than other offerings and it simplifies the management of your own matters as well as your team’s matters. I would highly recommend Xakia Matters as a matter management solution. Xakia provides us with real time visibility on the workload and competing priorities of our legal department. We have found it to be a critical tool for resource allocation purposes and optimizing team efficiencies. One of the greatest challenges facing any in-house legal department is how to effectively demonstrate “value” to the broader business through imperical data. Xakia enables us to numerically substantiate how the legal team actively contributes towards the company’s strategic goals and key metrics. We can also identify recurring high volume / low risk work items with a view to refocussing team attention and effort towards those matters which directly support and impact our company’s strategic agenda. Xakia has had tremendous benefits in helping our legal team prioritise and report – not sure how we worked without it! 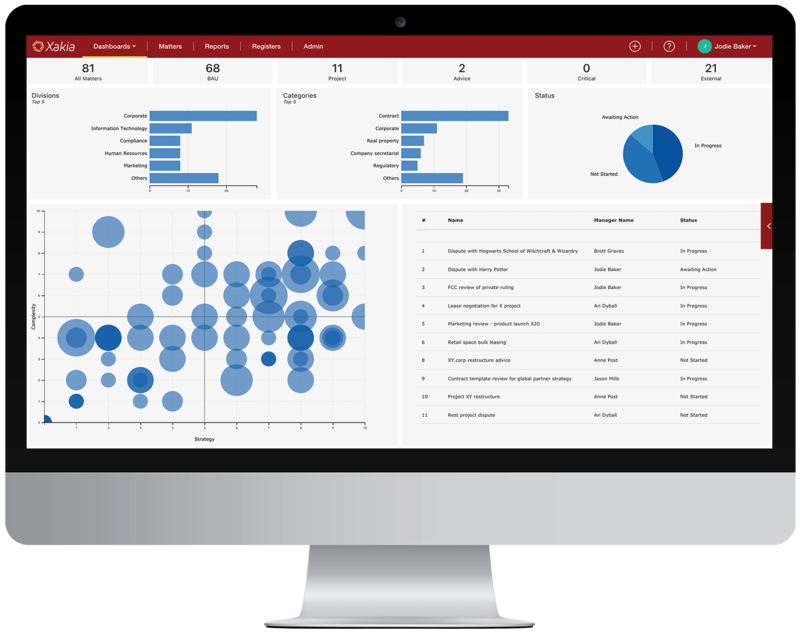 Xakia provides reporting and data visualization tools that highlights the legal team's contribution to the business. For the user it's so simple and quick to use. Xakia has provided us a clean, user-friendly and effective way to track the matters our team works on. The integration with Net Documents is seamless – a critical feature for us. We have found the Xakia team to be great listeners, agile developers, and keenly interested in meeting their clients’ needs. Xakia has become a key foundation of our legal technology architecture. Xakia gives us the ability to visualise where our legal team is investing its time and effort, and enables us to easily and graphically demonstrate our value add to the business. Xakia to us is not just a data collection tool, but is a way for us to define our key metrics, and measure how we’re tracking against those metrics in real time. It’s added a new dimension to our ability to focus on key objectives, and to identify things we can stop doing as well as the areas we need to focus more on. It’s difficult to get beyond blocking and tackling and get strategic without knowing who’s doing what. With Xakia, if you graph your matters, you can quickly arm your GC with knowledge to get the department more strategic. Xakia allows us to monitor and keep track of all ongoing matters with ease and efficiency. Team collaboration is enhanced by having matters centrally located and easily accessible from any location. 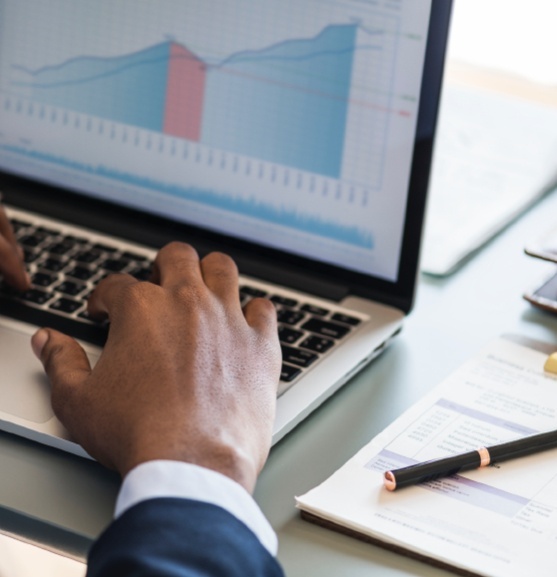 The ability to produce tailored reports in real time has been a great asset to the team and the business, and with each new update and instalment, we get better value from Xakia. Xakia was created for lawyers by lawyers. Our simple cloud-based software requires no installation, no hardware and for most users, little or no training. Are you ready to transform from the overworked “Department of No” to a well-organized team of strategic advisors? and industry and size benchmarking in just 20 minutes.